I also had an RE bought it with my danger pay in 1984. Cash R5200! Out the box. iS there a pic of u and me on your first bike way back whEn? Nogal 'n Wheely L ! the ones who let in the light! 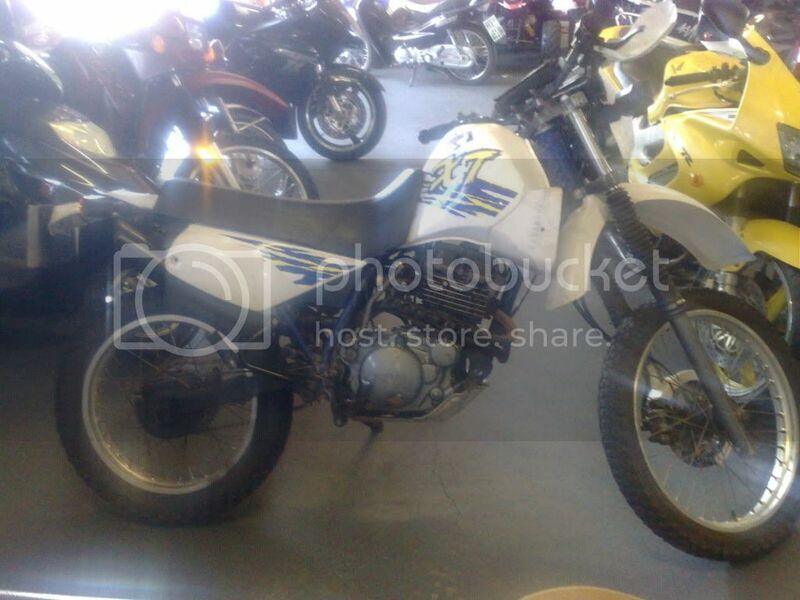 My first new bike... approx 1983 / XT 500 / pre-ATGATT / Woes Rand bought with "PW Botha & Sons skt en odt"
1991, I was in Std 8. Before I bought my first 50cc Suzuki TS50 did my father buy this(similar to pic) BMW R 100/7 1975 model. Had 33000km on the clock and he paid R 7000 for it. It stood in the garage and I was only allowed to ride it on Sundays. He accompanied me on his 1986 BMW R100RT and we usually drove to the local Pick 'n Pay parking lot so that I can learn how to ride this big bike. When I eventually got the Suzuki.....it was a different experience and not the same as driving the B'M. Traded the BMW in 1993 for a Alfa Export 1500cc......because a matric pupil would rather prefer driving something that he can take more than 1 friend with him........ ........what a MISTAKE. I should NEVER have done that.....but...that's history. A mate had one of these Zundapp s. Went like a batt out of hell..nothing in its class could catch it if i remember correctly. My first bike was a Moto Guzzi 125 two smoke. These pics are a nice trip down memory lane, thanks boys and girls. My mom didn't allow me to have a bike while I was growing up, so I got my first one when I was 18. An '81 XR 500. Man, that kickstart used to kick like a donkey! I think I paid R4500 for it. First bike i ever bought with ABSOLUTELY GEEN KENNIS, out of Bike SA classifieds, private ad but from one of the Bike shops in Klerksdorp. Bike price R8500, to get looking nice firts round of repairs R5500, Seat, Handlebars, tyres etc. Than not happy with how it was running phoned Linex Yamaha for a quote on some spares(Still waiting for that quote mind you) Phoned JHB Yamaha got a spares quote within an hour, speak to the guy in charge of repairs he says he will collect no charge, I am in Linden they are in Edenvale, get the bike back, New rear hub new spokes alles lekker, bike running like a bomb(R25000.00all sorts of little replacements everywhere, all justified) , but smoking alot, mechanic tell me motor is about to die, in the meantime I had bought new(sec Hand) footpegs, rear brake pedal assembly exhaust etc from bike hospital( only guys with spares at that point, affordable) ask them about a good second hand motor, ja we have one blah blah blah ,transfer the cash ask if they can deliver to JHB Yamaha, sure no problem more blah blah blah, The Guys from JHB Yamaha do everything to get bike roadworthy comes time for the road worthy the motor comes up as Stolen, phone bike hospital no they will sort it out, this lark carried on for about 4 months, Eventually Bike Hospital say they will get it through and on the road, fine deliver to Bike Hospital and pay JHB Yamaha( about R25k) after another 4-5 months I told Errol pay me for the bike and keep the farking thing cut the losses and LEARN A VERY EXPENSIVE LESSON. This all happened before I was very active on WD. Eina, not so lekker first bike memories. It happens, learn from it and move on. STill paying some of it off, but now I have a Healthy XR650L and loving it, still have a soft spot for the Yamaha's though, and I lay the blame squarely at the feet of the XT500.